The Japan Foundation, in collaboration with the Embassy of Japan in Pakistan and the Pakistan National Council of the Arts (PNCA), has arranged the exhibition of Japanese dolls, representing the wide range of styles and forms that have evolved over the 13,000 years that dolls have been central to Japanese culture. The display drew in crowds of people on the opening day. Viewers were fascinated by the diversity of dolls on display ranging from the ‘Hina Ningyo’ and ‘Gogatsu Ningyo’ to theatre dolls and imperial palace dolls. Japanese ambassador Hiroshi Inomata inaugurated the exhibition that will remain open for public viewing till the 30th January. “The purpose of showcasing the exhibition is to give the visitors a close glimpse of the versatility and individuality of the traditional and cultural life of Japanese people through these artistic handmade objects” said the Ambassador. The modern side of Japanese people may be more more evident but they are as connected with their traditions as advanced in modern technology. “No matter how much progress we make in the world through our up-to-date machines and robots, we Japanese, still keep intact with our traditions and values and these handcrafted dolls are still significant for us today as they were for our ancestors” the ambassador informed. The exhibition features Japanese dolls created during the eighteenth to early twentieth century, representing a variety of characters including emperors and empresses, warriors, infants, mythic and folktale characters, gods, dancers, and actors. A majority of the dolls exhibited were created during the last century of the Edo period (1603–1867). With delicately carved hands, faces painted white, and lavish silk brocades, these dolls demonstrate the long-standing craftsmanship, originality, and iconography of Japan’s Ningyo culture. “Dolls have been important to the Japanese culture for centuries. They reflect the history of Japan from prehistoric to modern times. In Japan, over the past millennia, the making of human figures has been popular in different ways, such as the talisman, the sacred object, the souvenir and the plaything” Ambassador Inomata enlightened. “Dolls, for the Japanese, have spiritual significance; they seal friendships, protect or purify those who use them, and some are ornament to celebrate young girls and boys at special occasions in praying for their future success and prosperity” he described. “Japan is a very great nation for art traditions. It is unfortunate that, in Pakistan, we only know Japan as a nation that makes cars and electronic items but we have neglected as a nation, to see the other side of Japan, which is the artistic side” Uxi remarked. Speaking about the extinct art of doll-making in Pakistan, he said grandmothers made paper dolls and cloth dolls and girls played with dolls and doll houses. “Our children have stopped playing with dolls now and are importing them which is unfortunate because we have lost the tradition of making our own dolls. So this is an opportunity to take inspiration from the Japanese to preserve our art and culture,” he said. Japanese are great nature lovers and artists, and is one of the few nations that values art and culture above anything else where artists are often titled living treasures, he said. The Japanese word for the dolls, Ningyo literally means “human figures” in Japanese, and specifically refers to traditional Japanese dolls. While human figurines can be traced to ancient Japanese rituals, it wasn’t until the Edo Period (1604-1868) that dolls truly flourished in Japan. 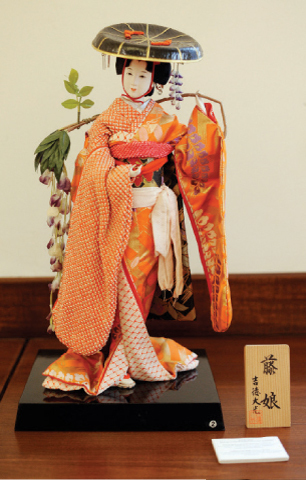 Traditional Japanese dolls have been used over time for every purpose from national festivals, purification rites, medical applications, theatrical endeavours, to important gifts of State and supplications and prayers.